At the same time that Ahmadinejad was speaking at the UN on Wednesday and while bamboozling the useful idiots around the world with his rhetorics of "justice", "freedom", "human integrity" and the coming of the saviour Messiah to rid the earth from tyranny and corruption, another newspaper, Shargh Daily, was closed down in Iran. The official reason for the closure of Shargh, was this cartoon that was printed on the back of its pages. 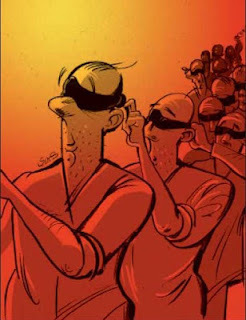 The cartoon that shows people blindly following one another and tying up each other's blindfolds, was interpreted as deriding the martyrs of the Iran-Iraq war going to the fronts!! More than 100 hardline Islamic Republic MPs also signed a petition to close down the newspaper. Member of the Cultural Commission of Majlis, a parliamentary body in IR, Hojat-ol-Islam Ali Taheri, who was a signatory to the petition, admitted he had not seen the cartoon but nevertheless signed the petition to close the newspaper! Perhaps the best case of manifesting the spirit of the controversial cartoon itself. In the Islamic Republic, all the newspapers have to appoint someone as the "Accountable Manager". Basically if anything goes wrong and if anything outside the red lines is printed, the buck stops with the "Accountable Manager" and it is his neck which will be on the line. The closure of Shargh, not only resulted in all its staff losing their jobs overnight but also the arrest of Mehdi Rahmanian its accountable manager and the cartoonis, Hadi Heydari. Rahmanian has served 18 months at the war front and the cartoonist, Hadi Heydari, is son of a war martyr. Yet somehow employing this Saddam sycophant by Press TV is not an affront to Iran's war martyrs!! The West is also adopting sharia and its totalitarian methods: I tweeted a cartoon about islam and my account was suspended. Yes Ahmadi and all the other nazis can spout anti-semitism and anti-Israel rhetoric freely at the UN and elsewhere: Jews die, 2 Israelis shot dead today by an employee in US, bomb at Toronto synagogue. No mention in MSM. 'Everywhere needs reform. Everywhere.' So expounded the usual nose twitching or should that be nose growing hypocrisy of Ahmadinejad on a recent Piers Morgan intyerview. Although as per usual he was allowed to pontificate, dodge, deflect and eat up precious air time to avoid any awkward questions that might trip up his grandstanding from the point of an oppressive tyranny. But just WHERE were the big challenging questions? Especially on Human rights and political prisoners? Once more Ahmadinejad excused his Khamenei puppet government by claiming it has no influence on the Judicial system, when of course it IS the judicial system! Right from it's corrupt heart to it's very autoritarian brain! If anything when it comes to blind folds, Ahhmadinejad is a past master in tying them around interviewers whem it comes to side stepping the issue that his own people are being crushed, silenced and over-ruled just as much as the Palestinian's! The two wrongs of Ziontist bigotry and his own Islamic tyranny doesn't make a right!